On this occasion, I dined with my Japanese business partner. Whenever we were together in Tokyo or the other cities we frequented in Japan like Utsunomiya, Ibaraki, and Gifu, he selected the restaurants, taking pains to find places that featured interesting regional dishes. However, when we found ourselves in other parts of the world, it was my turn to host. 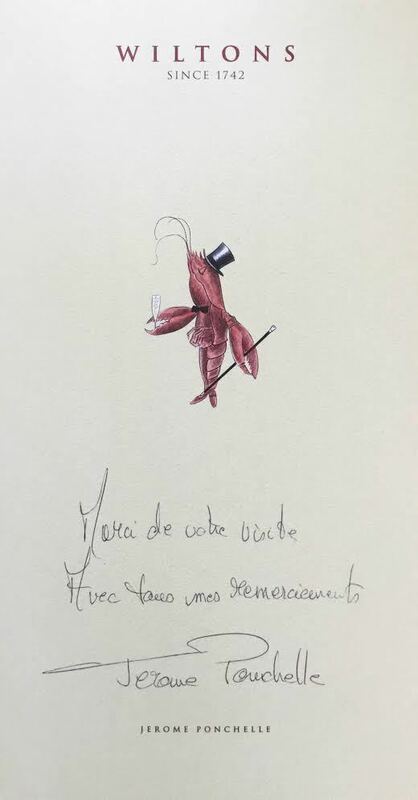 At the end of this meal, Chef Ponchelle presented us with this signed menu, asking that we wait for a moment while one of his assistants brought out his personal seal. It arrived in due course, whereupon the chef meticulously stamped his name on the page with the daily specials. 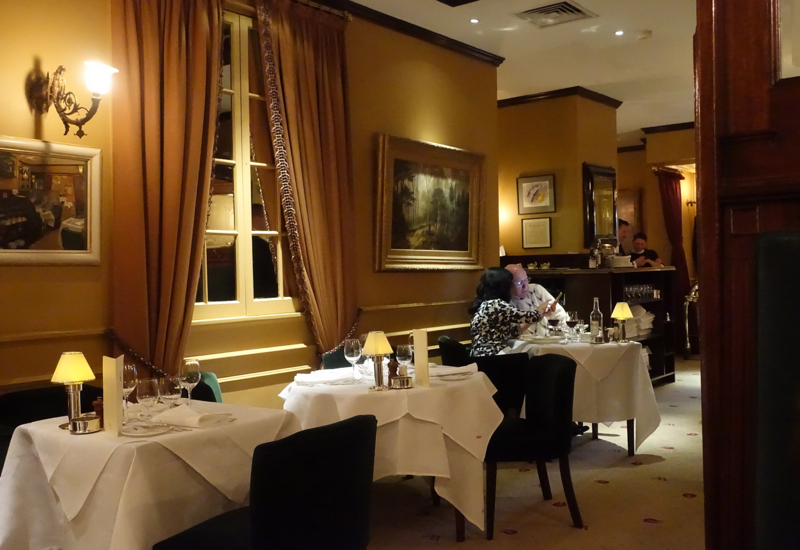 Simple English fare prepared in accordance with French culinary tradition and exactitude. It hardly gets any better than that. 1. 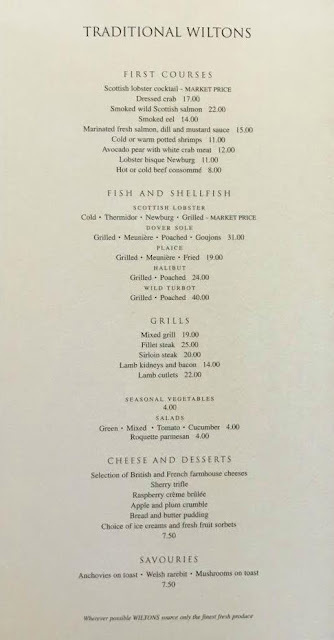 R. W. Apple, Jr., “An Epicurean Pilgrimage: Meals Worth the Price of a Plane Ticket,” New York Times, 22 October 2006. 2. 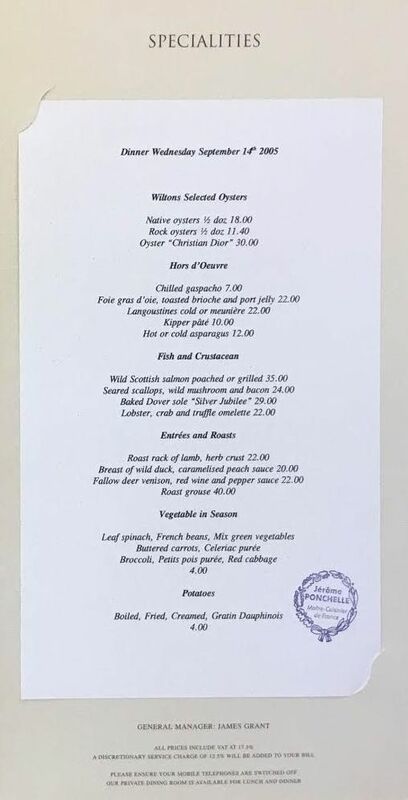 The prices on the menu are in British pounds. In September 2005, one British pound was equivalent to about $1.82 US. Nicely done Henry. I recall that Elizabeth David wrote that F.X. Boulestin, the interwar French restaurateur in London and food writer, praised good English eating. It was imitation French food he thought less of. She was trying to make the point that if the English took as seriously their traditions, overall standards would be higher than was the case in her era. Clearly for the meal you recalled, it was an example of French chefs (or some clearly) of a different generation appreciating fine English foods and presenting them at their best. I believe today the English have gained a new appreciation for the best in their culinary past and that Wilton's stands as a pioneering influence in this regard, among some others. It is still one of the top tables in the city I'm told.